Additional running time incorporated on Saturday daytime journeys affected by Football traffic on Deepdale Road. Sunday service reduced to hourly after 8pm. Monday to Friday, additional running time incorporated at afternoon peak times. Sunday service reduced to hourly after 5.30pm. Service 14 will terminate at Holme Slack, Lily Grove and will no longer serve the Ronaldsway and Longsands area. Operates on a 30-minute frequency. Last journey from Bus Station to be around 10pm. Improved frequency of every eight minutes from 7am Monday to Friday. Minor change to timetable, reflecting Fulwood Academy change of start and finish times. Additional journeys introduced to cope with high volume of passengers when Fulwood Academy are in attendance. Service will be extended to Lea operating around Thorntrees avenue and Aldfield Avenue as service 89 operates currently, this is to improve reliability between city centre and Savick Estate, as additional time will be incorporated in to the service as a whole. Savick Turning Circle will only be served on outbound journeys, West Park Avenue will be operated along in both directions. Sunday frequency reduced to every 30 minutes. Late Friday and Saturday journeys removed due to low usage. Last journey to Savick estate and Lea will be 9.13pm Monday to Saturday. The terminus will be changed to Sainsburys on Tanterton Hall Road. Minor timetable improvements with increased frequencies at certain times of day. Late Friday and Saturday journeys to commence from Boots on Fishergate departing at 11.30pm, 12pm, 00.30am and 1am. Punctuality and reliability will be reviewed once major road works on Adelphi Quarter commence. Journeys extended to Cottam Hoyles Lane, in a clockwise loop operating via Merry Trees, Haydock Lane, Cottam Way, Lea Road, Hoyles Lane to Nog Tow then Tag Lane back towards City. Monday to Friday journeys pre 9.30am and post 2.30pm will operate direct via tag lane and not serve Whitby Avenue. Extension introduced to serve new housing off Hoyles Lane. The service will finish around 6pm. Journeys extended to serve Savick Estate before terminating at Larches. Journeys towards RPH will be extended early morning to the North East Employment Area, and daytime journeys extended to Preston’s College. Will no longer be extended to Lea (see service 31) journeys will operate clockwise around Larches Estate before returning to City via Blackpool Road, turning right at Greavestown Lane traffic lights. September will also bring changes to Stagecoach bus timetables. 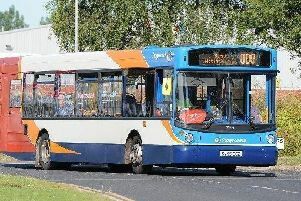 A spokesman for Stagecoach Merseyside and South Lancashire said: “Stagecoach timetable changes will come in to effect from September 2 to reflect the increase of demand as students go back to school. “We’ve listened to feedback from regular users of these buses and acted accordingly. We regularly evaluate our routes and look to see where we can improve. Restoring the normal Monday to Saturday frequency following the school holidays. Operating the 4C hourly on Preston College Days only. Service 4 to maintain half hourly combined service between Preston and RPH. Due to the anti-fracking protests at Preston New Road the timetable has been adjusted. The 4.55pm service on college days only will depart at 4.40pm from Preston’s College and operate 15minutes earlier throughout. Back to standard service Monday to Saturday following school holidays. Service 125C journey from Charnock Richard to Preston’s College will extend and terminate at Myerscough College.